Hello friends! Last week flew by in a blur, but there's no more room for slacking as I'm hosting this month's Vintage Sewing Pattern Pledge activities! If you missed out on any February's #vintagepledge fun, Kestrel Makes has shared a comprehensive round-up. Now, I don't want to say that #vintagepledge has peaked too early, but how can we beat an outing at the Oscars?!? 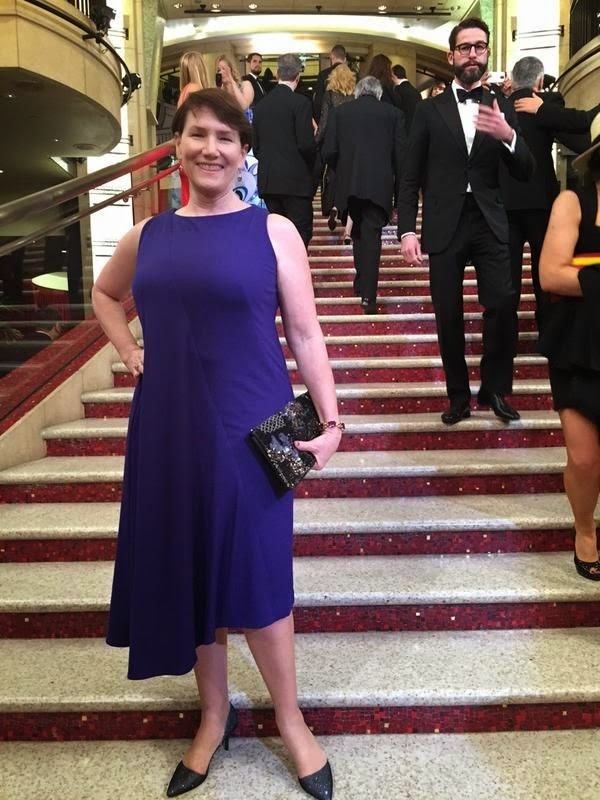 Julie of Jet Set Sewing made herself a Madame Gres design out of merino wool jersey for a glamorous, yet effortless, red carpet look! 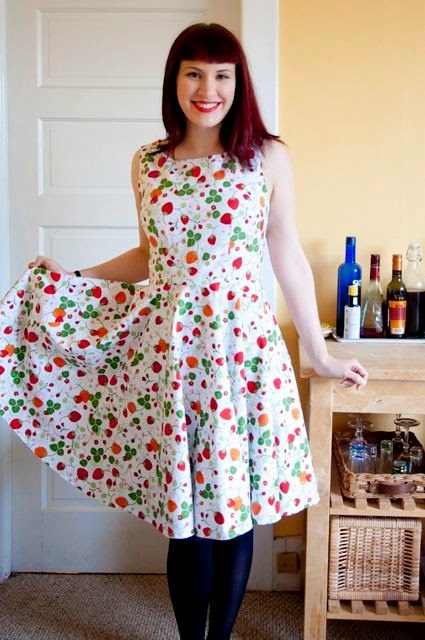 Prolific knitter Andi, of Untangling Knots, set aside her knitting needles for #vintagepledge and stitched up a reproduction pattern in a delightful strawberry-print. Michelle, ma belle...tres bien ensemble combined vintage and contemporary patterns for a dramatic look, channelling her inner Ulyana Sergeenko. A wrap dress made of faux suede?!? Sara of Mixed Emotions was truly inspired with this gorgeous combination, which brings me yet another step closer to embracing 1970s styles! Evie of La Couturiere Dimanche made what can only be described as the sweetest maternity dress ever. And best of all, it was a 100% stash-buster! Just Sew Jenna introduced me to a brand new concept - dungalottes! 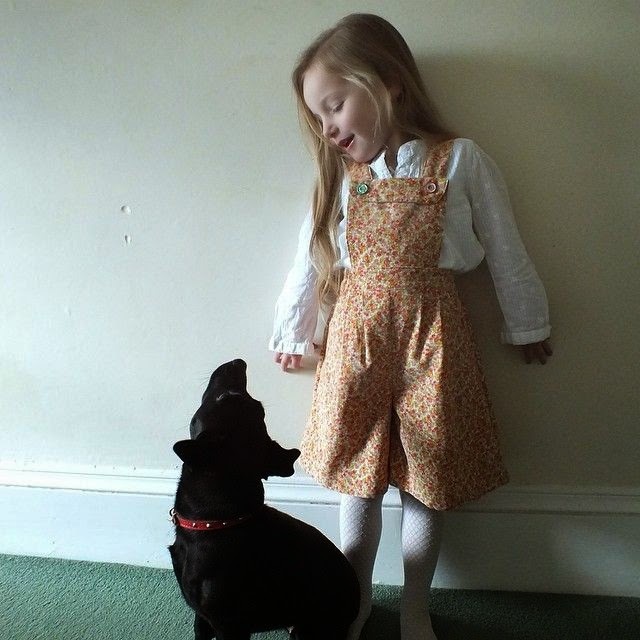 Doesn't her little girl (and photo-bombing doggy) look adorable in these vintage-inspired dungaree culottes? This month is generously sponsored by Remnant Kings, a family-run, Glasgow-based business offering an extensive collection dressmaking and furnishing fabrics, knitting supplies and haberdashery items. Remnant Kings are kindly offering a 10% discount across their online selection for the duration of March - just use VINTAGE10 at the checkout. They're also offering one lucky winner a £15 voucher to use either online or in store, as well as a surprise goodie bag! The giveaway is open internationally and will close at 5pm GMT on Monday 30 March. To enter the giveaway, leave a comment below telling me what you would spend your £15 Remnant Kings voucher on...don't worry, you can change your mind if you win! Have a productive vintage stitching month! I'm going to Glasgow on April 10th so would spend it in store when I get there. I absolutely love the Remnant Kings store! I love Julie's dress - it's such a star, so very worthy of the red carpet:). some beautiful choices for your round-up :o) for the giveaway I would probably buy more fabric, possibly something out of my usual comfort zone, just for the challenge! I would definitely get some fabric! I would buy one of the Liberty Arts prints - they are all gorgeous. Lots of knit fabrics as I've just treated myself to an overlocker and need to get stuck in! But there are some nice knits too. Definitely fabric, probably something treat-worthy! I feel so honored to have made it to the spotlight! And I LOVE Michelle's skirt. I immediately thought of Ulyana Sargeenko before I'd even read the full post. Love RK online - even better now with Hazel at the online helm, Would definitely buy some more of their faux leather! I think I would treat myself to either the BHL Flora or Kim patterns. Would love some floral jersey, or maybe a Liberty print. AnnieS. Either a Dahlia dress pattern or some lining fabrics to match the fabrics I have plans for. Thank you. Ah, Remnant Kings! I grew up in Edinburgh, and they had a store there as well. Not sure if I dare look online - Kestrel Makes' post about her quilt introduced me to Frumble, and I've already seen a ton of fabrics I want to buy there!! Loving what people have come up with already - I can't wait to be reunited with sewing machine soon! I would spend it on the strawberry printed stretch denim. My daughter pets and swoons over it every time we go in. Hehe. She is three, but I understand lusting after a partucular fabric. It would definitely have to be some liberty art fabric. It's lovely stuff! Some great vintage pledge picks - I particularly love Michelle's skirt, it's such a lovely colour! And thanks for the giveaway - I think I'd put the £15 towards some lovely Liberty fabric. I would pick up some of their awesome cotton prints. Thanks for a chance to win! Thanks for the shoutout among all of those beautiful makes! It's great to that so many people are reviving these patterns. They're history in an envelope! Gorgeous! 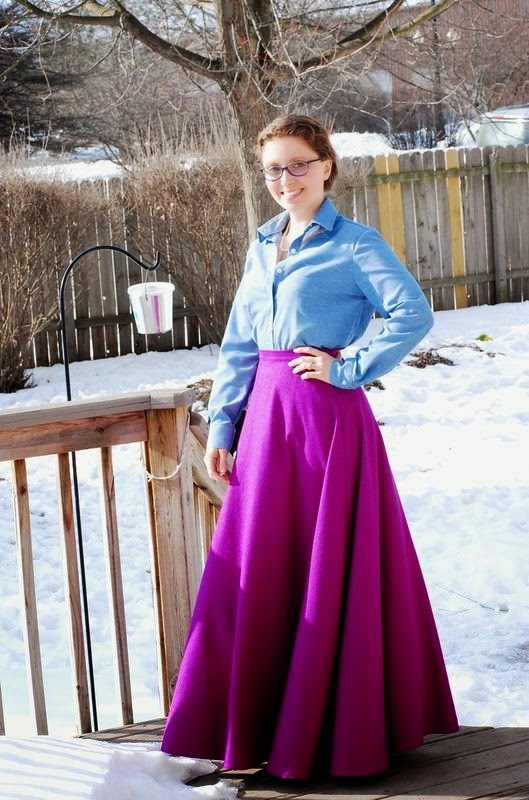 What wonderful inspiration, I'm new to sewing, but I really look forward to making some skirts and dresses. The hard part is deciding on what fabric with so many amazing choices! I love the Bird Print Viscose in both colourways, but especially in Navy. Liberty Arts fabric for sure. I would just like some 2 inch scraps. Love that fabric. The Strawberry dress is delightful! p.s. I love Evie's maternity dress - I'd just wear it even if not pregnant! That fabric is gorgeous! Love Remnant Kings and was browsing in their Crow Road store last week. I love the umbrellas fabric in denim, thinking it would make a fab skirt and be Glasgow weather appropriate!! I'm looking out for summer dress fabrics, pretty florals. Maybe I would push the boat out and buy some nice Liberty Tana Lawn prints. I'd use it as excuse to splash out on some Liberty Art print fabric! I would buy fabric. Love all the outfits. Thanks for the chance. I love the liberty art prints for a fluttery skirt. Thank you for the giveaway! I'd use the voucher to buy lovely fabric. Adore that long pink skirt, it's gorgeous! I love Michelle's skirt. Ive got my eye on some coating fabric from remnant kings. Textured floral jersey is lush. One thing I need is some of their Velcro Heavy Duty Stick On Tape - White! God bless! I would buy Liberty Arts fabric! I would buy fabric for quilting! I would spend it on Thread, bright pink and red. And some ribbons, the Glitter Ribbon -Red, and probably some others. And the Blue Football Iron On Motif. One of my favorites is Liberty Art Fabrics Hubert - Pink. 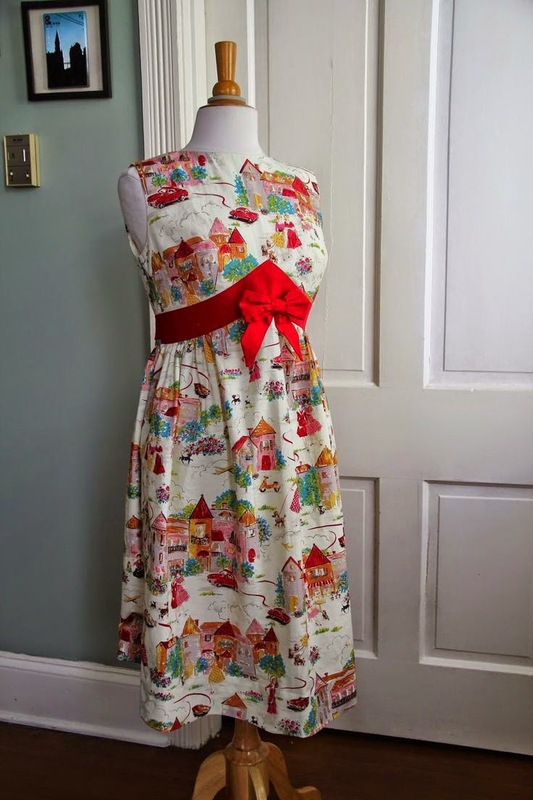 I think it would make an adorable little dress for my toddler niece! What a great give away! I'm so excited because I've just bought my 60's skirt kilt pattern for my vintage pattern pledge and Remnant Kings have a great selection of poly tartans and twill fabrics that I'd love to make some in. I would buy a charm pack - there are a couple that I love! Thanks for the chance to win. Cotton sateen - probably the ikat, although it's pretty hard to choose! I would definitely be buying the Javanese Print fabric in Turquoise - I think it would make a perfect summer dress! Thanks for the chance to win! I'd probably choose one of the Liberty of London prints, although which one would be hard. Thanks! I would choose the Printed Fleece - Ladybugs which is so adorable thanks for the chance to win! I would love to buy some vintage fabric! Thanks for the giveaway. I would select some quilting fabric. Thanks for a wonderful giveaway. Oh, my! Either patterns or fabric. I'll have to think about it for a bit! Thanks for the giveaway and this site! I'd buy poplin and maybe a colette pattern! I love the spot poplin in red. I would get the Moda 3 Sisters Whitewashed Cottage Jelly Roll. I would have to put the money towards buying a length of the Salso Stripe fabric in navy. I recently scored an early 1950s dress pattern from a local charity shop (for 10p!!!) and have a dream of combining a modern fabric with a vintage shape. I love your blog by the way, I read it as a reward for working on my PhD! I would use it on some of the umbrella print fabric! I would buy some lovely fabric!! I'm having a love affair with Crepe - Triple Crepe Fabric - Royal. I love Glasgow.. There are some gorgeous spring blossom poplins - I think I'd go for one of those! A close friend has just had a baby so I would put it towards a moda charm pack to make him a quilt, thanks for the giveaway!